RBA’s dovish comments on a more “neutral” policy stance from its previous hawkish position triggered a sell-off in the AUD and partially affected the NZD. Economic growth and inflation forecast were also slashed, further exacerbating both currencies’ decline. NZD plunged to a two week low against the USD after disappointing jobs data raised the odds of a rate cut by RBNZ next week. Unemployment rose to 4.3% QoQ vs. estimates for 4.1% while employment change also slumped to 0.1% QoQ. US Federal Reserve Chairman Powell to speak again on Wednesday and may offer some insights into future rate decision as he avoided making any such comments in his speech last week. US Treasury Secretary Steven Mnuchin and Trade Representative Robert Lighthizer will be traveling to China in the upcoming week to continue trade negotiations. RBNZ is expected to hold rates steady on Wednesday. The press conference and inflation expectations an hour later would be most watched as it will offer clues of a future rate hike or cut. The initial impact of the rate decision may also be reduced or amplified depending on the contents of the press conference. Modest gains in US CPI is expected while its core CPI data to remain unchanged on Wednesday. RBNZ Gov Orr will speak on Thursday and NZD can reverse from its Wednesday movement depending on his comments. So nothing is set in stone until the market digests his speech. US retail and core retail sales data will be released on Thursday with sentiments tilted to the downside. US PPI data expected to come in stronger at 0.1% from the previous period of -0.2%. Upside seems limited for NZD but will RBNZ surprise markets like RBA and BOE? Last week, the market witnessed a couple of surprising moves by the central banks of Australia and the UK. The rate decisions met market expectations, but the governor’s comments were unexpected as they hinted at future rate decision. First, RBA met expectations by holding rates steady and triggered a rally, but it was short-lived, with price plunging the next day after its governor switched from a previously hawkish stance to a neutral policy view – that a rate cut is now possible. BOE was slightly different. They also held rates steady due to economic uncertainties surrounding the Brexit, but its governor’s speech afterward left the door open for a future rate hike. The result was an initial sell-down which then suddenly reversed mid-day. Therefore, the principal question is, would we see similar comments from the RBNZ? There is a consensus amongst central banks that global growth is slowing and weakness further exacerbated by trade wars, Brexit and the US Government Shutdown. Thus, certain gloom would continue to weigh on risk-sensitive assets. RBNZ is mainly focused on balancing the risks associated with pursuing growth and its resulting inflation. Economic growth in New Zealand has slowed while inflation remained close to 2%. From the previous monetary statement, RBNZ signaled that though it is comfortable with higher increase in the medium term, it remains cautious on the upside risks to inflation and believes it has intensified. Now, they are at a crossroad because downside risks to growth may have started to set in as the jobs data came in weaker than expected last week. However, it may still be premature to conclude that it will get worse from here on. This is because the current unemployment rate is barely at its worst. Instead, the uptick in unemployment still places it in a better position than it was in periods preceding the last period. It has been on an overall decline while interest rates fell and then held steady. Therefore, not all is lost, and it is expected that RBNZ will take a wait-and-see approach by holding rates steady again while revising down its growth forecasts. The result of such an action can trigger a sell-down, but RBNZ may also signal that it is open to future rate hikes if growth and employment improve in the next few periods. Traders should take note of what is said after the rate decision and not over position themselves before the governor’s speech as RBNZ may make similar comments like BOE. Prices plunged last week after NZD/USD failed to break up the previous support, now turned resistance area of 0.69185 to 0.69720. The currency pair is currently sitting at the low of the last two weeks. As highlighted, the initial sell down may bring this pair to its next support level at 0.67085 where previous bullish interest was present. If supported well, we may see the pair retest the resistance level of 0.67935. 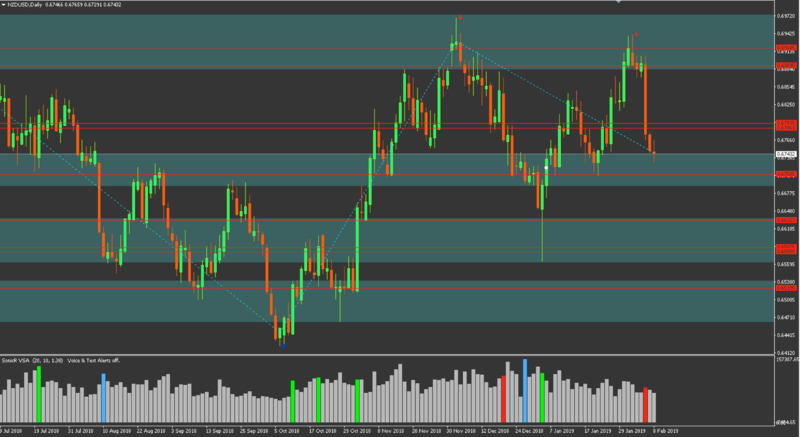 A break above this level can bring the pair up fast to between 0.68895 and 0.69500 area. Conversely, if RBNZ were to take on a more dovish stance than expected, the pair could gather enough strength to break below the support level of 0.67085 to 0.66323 and eventually to 0.65800.